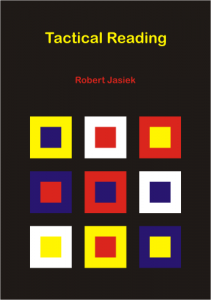 “Reading is the process of imagining tactical sequences of well-chosen moves,” says Robert Jasiek. “Besides strategy, reading determines a player’s skill.” “Tactical Reading,” Jasiek’s latest book – his 11th– uses the holistic approach of general theory applicable to all tactical problems. “Powerful principles develop every essential aspect of the theory of tactical reading,” Jasiek says. “Various kinds of simplifications and techniques reduce a large and unmanageable set of choices to the smallest possible number of necessary variations.” The book explains in detail a general method which Jasiek says will lead to “correct and efficient reading.” Application of the theory to 100 problems and their exhaustive answers demonstrates “the best way to distinguish inferior from the interesting moves.” Click here to order from Jasiek or go to Goshop Keima. A new girls tournament is planned for the 2015 Go Congress in St. Paul. Since this is the first year, the tournament will be open to the four girls who have the highest AGA ratings and wish to participate, they must still be 15 on August 1 in order to qualify. Registration will be done at the check-in for the Congress. The format will be two rounds, tentatively set for semifinals on Sunday afternoon with the winners meeting on Thursday afternoon for the finals and the losers playing for third and fourth places. Cash prizes will be awarded to the players ($100, $75, $50 and $25) as well as the title of 2015 AGA Under 16 Girls’ Champion for the winner. “The intent of the tournament is to inspire younger girls to get out to tournaments and play rated games,” says organizer Ted Terpstra. For more details, contact Terpstra by e-mail. Photo by Peggy Yang: Two girls trying to raise their ratings at the 2015 San Diego Go Championship. Tournament Director, Evan Cho, 9-dan, is an interested observer. 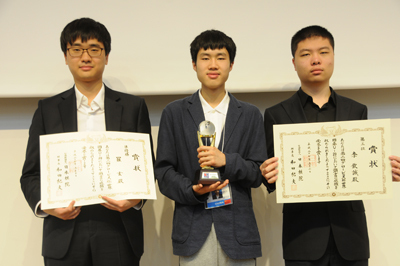 Huang of China Wins Globis Cup: Huang Yunsong (at right in photo) of China has defeated Na Hyun of Korea to win his first international tournament. Aged 18, he can now claim to be the strongest teenager in the world and his next ambition is to win an open international title. His play in this year’s Globis Cup was so impressive that no one will be betting against him. On Sunday, May 10, the third day of the tournament, the semifinals were held in the morning and the final and play-off for third place in the afternoon. 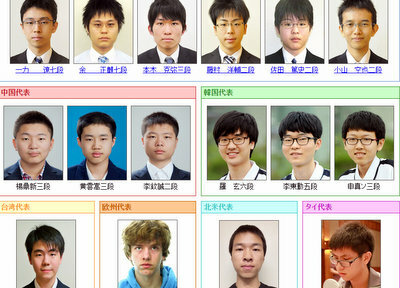 All four matches were China-Korea pairings, as the Japanese players had been eliminated in the quarterfinals. In the first semifinal, Huang 3P (W) of China beat Lee Donghun 5P of Korea by resignation. This game featured a spectacular fight in which Huang killed a large enemy group. O Meien 9P, who gave a public commentary on the final, praised Huang’s play in the semifinal very highly. According to O, the fight looked like a very perilous one to the onlookers that could have gone either way, but once the fight started Huang played quickly, not bothering to use all of his time of 30 seconds per move. In retrospect, said O, it became clear that Huang had read it all out at the beginning of the fight, which was an awesome feat. 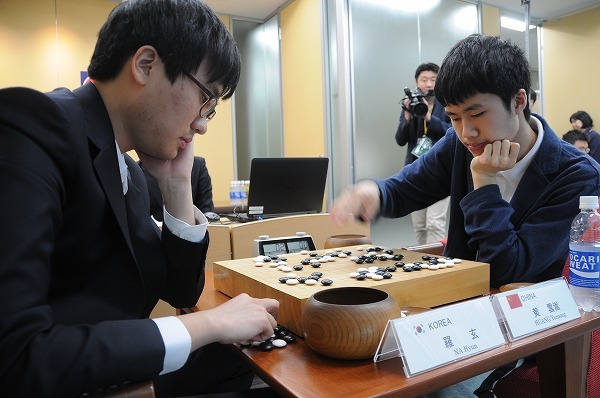 In the other semifinal, Na Hyun 6P of Korea (B), the only player to announce publicly his intention of winning the tournament, defeated Li Qincheng 2P of China by resignation. The final between Huang and Na started at 1:00 in the afternoon, with Huang playing white. Although no Japanese representative made the final, there were only a few empty seats in the hall. The fans who turned up were treated to an exciting game that was graced by an excellent commentary by O Meien 9P and Mannami Nao 3P. O is the commentator of choice for international games, as he is well informed about international go and is very open-minded. By this, I mean that he is not dogmatic. Although he is well-known for his own distinctive style, a dynamic, influence-oriented way of playing, when players follow a different style, making moves that he doesn’t like personally, he readily admits that they may know better. O’s humor meshed well with the bright, cheerful personality of Mannami Nao, the younger of the two Mannami sisters; she has developed into a very competent and appealing MC and assistant commentator and is a real asset in go events. After the first major fight in the early middle game, O expressed surprise when Huang played a relatively peaceful move after reducing Black’s right-side position. O hadn’t thought the maneuver was a particular success for White, but Huang’s calm play made him reassess his positional judgement. He admitted that he couldn’t reach a definite conclusion himself, but commented that we could safely trust Huang because of his experience. Na’s subsequent play showed that he felt he was a little behind. He launched an all-out attack on an unsettled white group in the centre, but he was outplayed by Huang in the ensuing fight and resigned early. One of the most interesting points in the commentary on the final was that O kept referring to the ‘experience’ of the players. For example, he would say something like, ‘I don’t know about this move, but my guess is that the player knows from his experience that it works.’ These players are teenagers, and though obviously they can’t have played that many games yet, what O seemed to be talking about was the high level of competition in China and Korea. Even at their young ages, their representatives in this tournament are already top players in their own countries, where star players seem to emerge in their teens. This is not really the case in Japan (with the major exception of Iyama Yuta). The strength of the Chinese and Korean teams is borne out by their ratings. Hori Masao, the father of the president of Globis University, Hori Yoshito, drew my attention to a Japanese site that rates 900 professionals (if you read characters, click here; it also has historical ratings going back to 1989). The Chinese team is in the lead. Sixteen-year-old Yang Dingshin is rated 18th in the world, tournament winner Huang (aged 18) 46th, and Li Qincheng (aged 16) 37th (probably thanks mainly to winning the CCTV Cup last year). The top Korean is Lee Donghun, aged 17 and 23rd; Na, aged 20, is 27th, and Shin Jin Seo (just 15) is 75th. To take the Japanese, Ichiriki (aged 17) is 128th and Yo Seiki (19) is 195th, and the others are much lower. Andrew Simons wins Candidates’ Tournament: Andrew Simons won all his games to win the first stage of the British Championship. The Candidates’ Tournament was held this year at The Fulbourn Centre with 24 participants total. The qualifiers for the Challengers’ League are Andrew Simons 4d, Charles Hibbert 3d, Desmond Cann 3d, Tim Hunt 2d, Richard Hunter 2d, James Hutchinson 1d, and Francis Roads 1d. However, Desmond Cann is this year’s UK rep for the World Amateur, so his qualification for the Challengers’ League is deferred for one year. His place is taken by the next placed person: Toby Manning 1d. Another German Winner for Bar-Low: The winner this year was German 3 kyu Tobias Ungerer from Cambridge University, who won 4 out of 5 games. His only loss was to Bogdan Ghica who came second on tie break.The event was held at the Junior Parlour in Whewell’s Court, Trinity Street. The Netherlands: The 18th edition of the Apeldoorn tournament, which never sees a dull moment since the playing times are always 30 minutes absolute per player (no byo-yomi), was played on the 3rd of May in Apeldoorn, the Netherlands. It was won by endgame master Rudi Verhagen 4d. Second place was conquered by young dog Ruben Cornelissen 3d and in third place trailed the ever friendly Siu Hong Chung 3d. Result table. 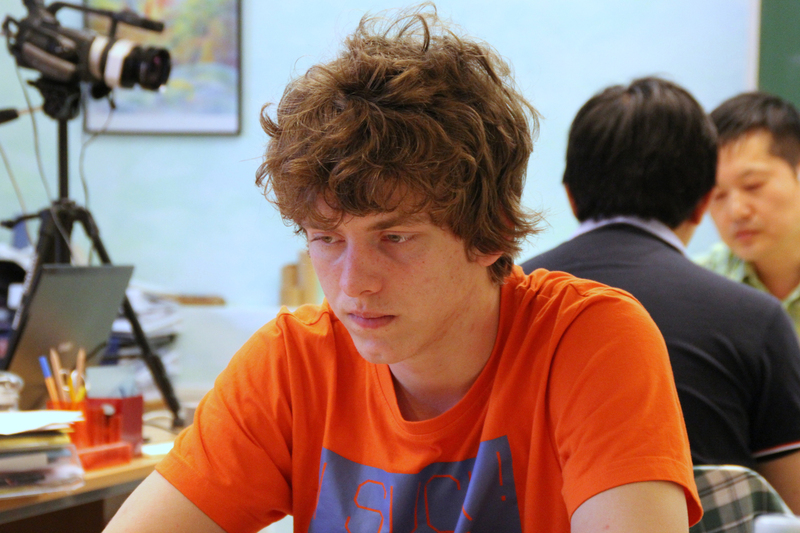 Denmark: The Danish Championship 2015, played from 5/1-5/3 in Odense, Denmark, was won by Jannik Rasmussen 3d. Second came Soeren Ohlenbusch 3d and with a remarkable effort, beating several dan players, Mathis Isaksen 1k came in third place. Result table. Czech Republic: The Czech edition of the Korean Ambassador Cup, a tournament which is held in many countries to determine the national representative player for the Korean Prime Minister’s Cup that usually takes place around September in Seoul, Korea, was played from 5/2-5/3 in Praha. European 1dan professional Pavol Lisy (right) took first place, with Jan Hora 6d coming second and Martin Jurek ending third. In total 71 players participated. Result table. Germany: The Sankt Augustiner Go-Turnier, played from 5/2-5/3 in Sankt Augustin, Germany, was a strong tournament with 76 participants of which more than 20 dan players. It was won by German champion Lukas Krämer 6d. Second came Bernd Radmacher 4d and third was Christopher Lieberum 3d. Result table. Russia: Talking about strong tournaments, the Japan Consulate-General Cup, played from 5/1-5/2 in Saint-Petersburg, Russia, had some of the strongest players of Europe participating. Dmitrij Surin 6d (left) managed to cause an upset by beating Alexandr Dinerstein 7d and losing only to freshly promoted European 1dan professional Ilja Shikshin. 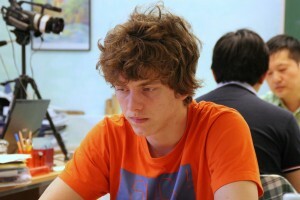 Because Ilja lost to Alexandr and to the Korean Jung-hyeop Kim 8d, he ended in third place. Alexandr Dinerstein, only losing to Surin, came second. This made Dmitrij Surin 6d the winner. As many as 82 people participated in the main tournament. Result table. Next to the main tournament a side tournament for beginners was organized, in which 44 players participated. It was won by Ivan Surovcev 14k, second came Artem Kolbasin 11k and third was Anatolij Nikonorov 15k. Result table. At the same time and in the same country, two and a half thousand kilometers away from Saint-Petersburg, the Championship of the Ural Federal District took place in Cheljabinsk, Russia. It had 46 participants and was won by Nikita Barykin 5d. Second came Tongyuan Yang 4d and third was Evgenij Manakhov 3d. Result table. Romania: In Braila, Romania, two junior national championships took place on the 2nd of May. In the finals of the category of under 10 years Ioan Alexandru Arsinoaia 12k proved himself to be the champion. Second came Victor Cristian Vasiloanca-Smirnov 15k and third was Daniel Pascu 16k. Result table. The Romanian champion in the category of under 8 was Mihai Matei 16k. Trailing in second and third place were Dragos Boldeanu 17k and Andrei David Decu 16k consecutively. Result table. Italy: The 21st Mauro Brambilla Memorial, played from 4/25-4/26 in Milano, Italy, was won by Francesco Marigo 4d. Second came Isamu Oka 4k and third was Andrea Failli 8k. Result table. 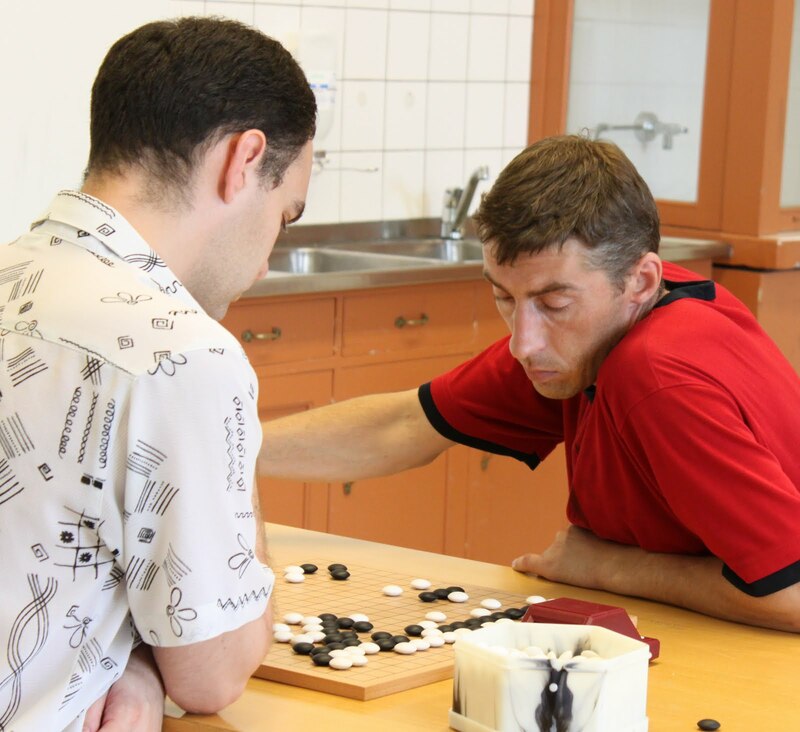 Austria: The Linzer Go Turnier 2015, played from 4/25-4/26 in Linz, Austria, was won by Pavol Lisy 1p (right). Second came Viktor Lin 6d and third was Michael Forstenlehner 2d. Result table. Globis Cup Update: China and Korea share semifinal places: Play in the second Globis Cup got off to a start on Friday, May 8, with the first two games of the first round being played in the four groups (click here for photos of all the players on the Nihon Kiin’s japanese-language site). For four players, two games were enough, as successive wins secured them places in the quarterfinals. Two of them, Huang Yunsong and Li Qincheng, are from China, and the other two, Lee Donghun and Na Hyun, are from Korea. (Previously I called Huang Kuang, but Huang is correct.) The six Japanese players all scored 1-1, which meant that their fate would be decided by the third game in the first round, played on Saturday morning. Unfortunately, the non-Far Eastern players, Pavol Lisy of Slovakia, Lionel Zhang of the USA, and Krit Jamkachornkiat of Thailand, were eliminated on Friday. There’s another correction: the program lists Krit as amateur 7-dan, but he is actually 4-dan. The fourth player eliminated on the first day was Lin Junyan of Chinese Taipei. Here are full results for the first day. Group A: (Game 1) Huang Yunsong 3P (China) (W) beat Ichiriki Ryo 7P (Japan) by resig. ; Yo Seiki 7P (Japan) (B) beat Lin Junyan 6P (Chinese Taipei) by half a point. (Game 2) Huang (B) beat Yo by resig. ; Ichiriki (W) beat Lin by resig. Group B: (Game 1) Lee Donghun 5P (Korea) beat Fujimura 2P (Japan) by resig. (colors not given in chart), Yang Dingxin (W) beat Pavol Lisy 1P (Slovakia) by resig. (Game 2) Lee (B) beat Yang by resig; Fujimura (W) beat Lisy by resig. Group C: (Game 1) Li Qincheng 2P (China) beat Motoki Katsuya 3P (Japan) by resig. (colors not given), Shin Jin Seo 3P (Korea) (W) beat Lionel Zhang 7D (USA) by 12.5 points. (Game 2) Li (W) beat Shin by resig., Motoki (W) beat Zhang by 9.5 points. Group D: (Game 1) Na Hyun 6P (Korea) (W) beat Sada Atsushi 2P (Japan) by resig., Koyama Kuya 2P (Japan) (B) beat Krit Jamkachornkiat 4D (Thailand) by resig. (Game 2) Na (W) beat Koyama by resig., Sada (B) beat Jamkachornkiat on time. The third game of the first round was played on Saturday morning. 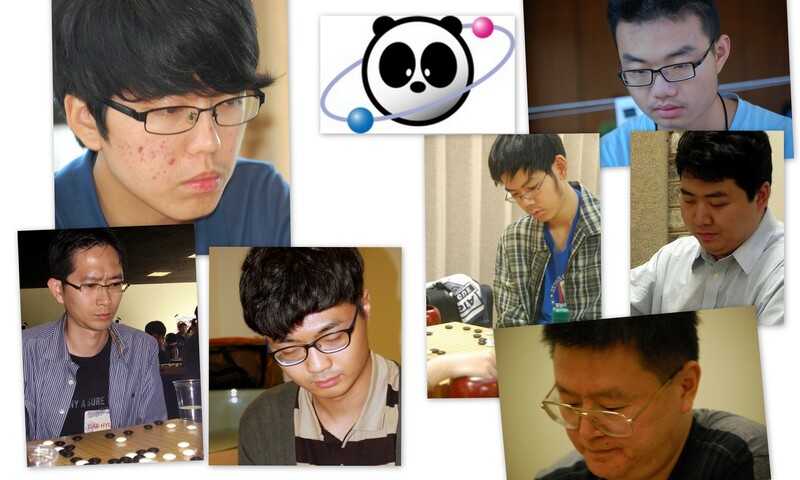 With six Japanese representatives surviving in the four groups day, that meant that meant four of them had to play each other. Unfortunately for Japan, its top two players ran into each other. Yo Seiki prevailed, eliminating last year’s tournament winner, Ichiriki. Full results: Yo (B) beat Ichiriki by resig. ; Yang (W) beat Fujimura by resig. ; Shin (W) beat Motoki by resig. ; Sada (B) beat Koyama by 2.5 points. The result was that all the three Chinese players in the tournament and all the three Korean players made the quarterfinals, along with two Japanese representatives. The quarterfinals were played on Saturday afternoon, starting at one o’clock. Results: Huang (W) beat Shin by resig. ; Lee (W) beat Yo by resig. ; Li (W) beat Sada by 6.5 points; Na (W) beat Yang by resig. The pairings in the semifinals, to start at ten o’clock on Sunday morning, are Huang vs. Lee and Li vs. Na. The Globis Cup World Igo U-20 is organized by the Nihon Ki-in and the main sponsor is the Globis Corporation, with Otsuka Pharmaceuticals and Kitami Hakka Tsusho Inc. acting as supporting sponsors. 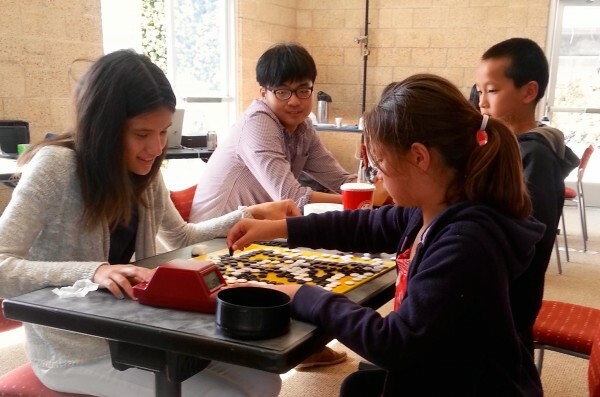 - from a longer report on Go Game Guru, which includes more photos and game records. The opening party for the second Globis Cup was held at the Globis University in Kojimachi, Tokyo on Thursday, May 7. The university consists of a graduate school in business and offers an MBA, which must make it unique among sponsors of professional go tournaments. It is located just a few blocks from the Nihon Ki-in in Ichigaya, a seven- or eight-minute walk up the hill toward Kojimachi; very convenient for the Nihon Ki-in players and staff attending. The party started with some energetic wadaiko or Japanese drumming. The sound could have filled a stadium, so it was overwhelming in the reception hall. In his welcome speech, Hori Yoshito, the President of Globis University, welcomed the participants from around the world and reaffirmed his intention of keeping the tournament going for 30 years. After a speech by Wada Norio, the Chairman of the Board of Directors of the Nihon Ki-in, and a toast, the pairings were carried out and the players were interviewed on the stage, each one introduced by a drum roll. Group D) Sada Atsushi (Japan), Na Hyun (Korea); Koyama Kuya (Japan), Krit Jamkachornkiat (Thailand). In their speeches on the stage, the players all kept it quite brief, expressing their gratitude to the sponsor and/or saying they would try to play their best. Only one player came right out and said what the others were probably thinking. Na Hyun declared that he would make up for his bad performance last year [he lost to Ichiriki in the quarterfinal] and do his best to reach the final, which he would win. There was a stir in the audience when Ichiriki and Yo ended up in the same group. Japanese fans would like to see this pairing in the final, so they will be hoping that they can both get through. If I understand the pairing system correctly, they won’t be paired in the second game in the opening round, but would have to be in a third game if they were both on 1-1. Incidentally, when I had a chance to speak to Mr. Hori, he expressed his appreciation of the coverage in the E-Journal. A number of other guests at the party were also subscribers.